A degree of religious interference, or not? Companies acquire other companies for a number of reasons - to acquire the people (FriendFeed's acquisition by Facebook), to apply technology in new ways (Google's acquisition of Neven Vision), and sometimes to keep the competitors at bay. I left Motorola before it split into two companies, and before one of those two companies (the phone portion) was acquired by Google. Dennis Woodside headed Motorola Mobility during the Google years, and he recently revealed that Apple's acquisition of Authentec put a damper on Google's plans for one of the Motorola phones. Indeed, the 6-inch Nexus 6, [Woodside] can now admit, was stymied by just one of those big players. A dimple on the back that helps users hold the device should, in fact, have been rather more sophisticated. “The secret behind that is that it was supposed to be fingerprint recognition, and Apple bought the best supplier. So the second best supplier was the only one available to everyone else in the industry and they weren’t there yet,” says Woodside. When Motorola Mobility was itself sold by Google, Woodside went to Dropbox. As it turns out, Dropbox was also a target of Apple's acquisition team at one point - but this time Apple didn't get the company. Dropbox was once dismissed by Steve Jobs as “a feature, not a product”, albeit after the company had rejected what has since been reported as a nine-digit takeover bid. Presumably Apple didn't believe that Authentec's products were commodities - after all, they were successful in THAT acquisition. The Illinois Bible Colleges Association, three Bible colleges, the nonprofit group Civil Liberties for Urban Believers, and student Leigh Pietsch sued Lindsay Anderson, chairwoman of the Illinois Board of Higher Education, on Jan. 16 in Federal Court. There are 15 Bible colleges in Illinois, none of which are certified by the state to issue college "degrees" - they may offer only "diplomas" or "certificates." The Bible schools claim that prohibiting granting of degrees to students who fulfill the requirements of their entirely religious curriculum violates the First Amendment. "We don't think there can be state regulation of a religious program," the Rev. Jim Scudder Jr., president of plaintiff Dayspring Bible College and Seminary, told The Associated Press. "If there is, then the state is deciding 'which' religion and breaking the establishment clause of the First Amendment." Are religious institutions required to obtain authorizations to operate and grant degrees in Illinois? All degree-granting institutions, including religious institutions, are required to obtain authorization to operate in Illinois. If a religious institution plans to award an associate, bachelors, masters, advanced certificate, or doctoral degree in any field, it must obtain appropriate authorizations from the Board. The rules provide a limited exemption for religious institutions that award only a “diploma” or a “certificate” and whose programs are solely devoted to religion and theology. For example, under this exemption, a religious institution could award a Certificate in Bible Studies of a Diploma in Christian Ministry without obtaining authorization. And before one complains that the IBHE is interfering in religion, well, it's interfering in business also. Are employers, employee groups, or professional organizations required to obtain authorization to provide training to employees? If an employer, employee group, or professional organization plans to award degrees, they are required to obtain authorizations. However, training programs conducted by corporations or other business organizations designed only for their employees are not subject to regulation by the Board. Similarly, neither labor union apprenticeships nor education and improvement programs sponsored by businesses, trade organizations, or professional organizations only for the benefit of their members are required to receive operating authority from the Board. But the biggest argument against the claim that the IBHE is interfering in religion is the fact that there are religious colleges in Illinois that are authorized to grant degrees. Lutheran Church Missouri Synod people are familiar with Concordia University Chicago, which is not in Chicago but is in Illinois. This university grants degrees; if it doesn't, then a lot of people that I know have been lying to me for many years. A much more famous religions institution in Illinois is Wheaton College, which also grants degrees. But I'm not sure where the aforementioned Leigh Pietsch attends school. In fact, the only Leigh Pietsch that I could find in Illinois was not a student, but someone who has been practicing law since 1972. Perhaps this Leigh Pietsch is a relative. I live in the United States of America, and in this country there is an ongoing tension between the rights that we enjoy as citizens - including the presumption of innocence - and the maintenance of public safety. We often state that we are a nation of laws, but all that it takes is the mention of an excitable word - such as "Communist" or "terrorist" or "Ebola" - and we kinda sorta forget the freedoms that we are supposed to be protecting. One issue that is receiving a lot of attention is a new law that was passed in Illinois. The stated intent of the law is to protect people from cyberbullying. Obviously, no one likes cyberbullying, so if you oppose the law, then obviously you are scum. School authorities may require a student or his or her parent/guardian to provide a password or other related account information in order to gain access to his/her account or profile on a social networking website if school authorities have reasonable cause to believe that a student's account on a social networking site contains evidence that a student has violated a school disciplinary rule or procedure. Three years ago...12-year-old Riley Stratton sued her Minnesota schools district after she claimed she'd been coerced into revealing her Facebook password. Last year, the case was settled with the Minnewaska Schools District paying Stratton $70,000. In this case, Stratton was accused of writing nasty things about her hall monitor. Oh, and there's one more thing, which I think was also pointed out back when Bozeman, Montana wanted to get employee passwords. If you give your Facebook password to a school district or city government, you're violating Facebook's own terms of service. So in essence, school districts are forcing young people (who often can't defend themselves) to surrender private information, give up their rights, and break contractual agreements in the process. Sounds like bullying to me. So anyways, I recently found myself beyond security at the Tom Bradley International Terminal at Los Angeles International Airport. As you can probably guess, I was there to board an international flight. Less than 24 hours later, I found myself on the outskirts of Paris, sitting in a restaurant that overlooked Aquaboulevard. What exactly is Aquaboulevard? 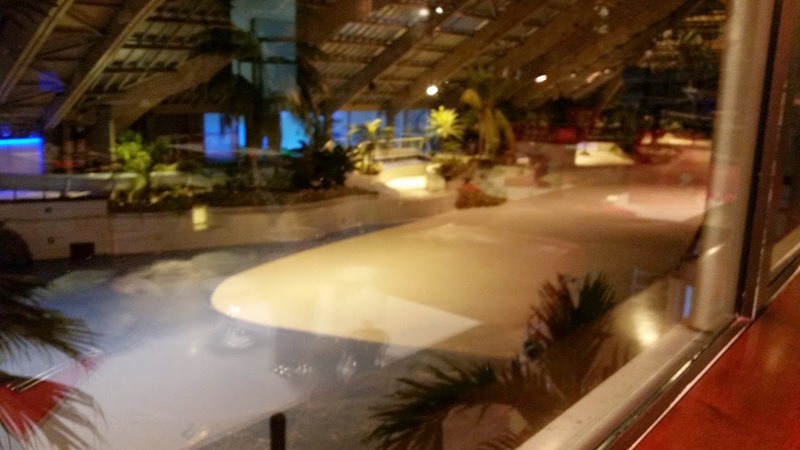 Well, it's the biggest indoor water park in Europe. You will find that Aquaboulevard has absolutely fantastic water slides and if you like long water slides then you definitely need to give the Aquaplouf a try at 80 metres, but for a far faster descent down a slide, the Aquaturbo may be just right, but personally a bit extreme for us. There is also a wave machine in one particular pool that is turned on and off at different intervals throughout the day and we think it was about every half an hour, but there are lots of other pools as well, so all members of the family can enjoy themselves, plus there are some lovely and relaxing Jacuzzi's to enjoy as well. While some people love the place, others are meh about it. I visited waterpark in Krakow (Poland) - it was cheaper and I had more fun there. So while Paris might be nice, it's no Krakow. Well, I had read about the place, primarily because I figured that I'd eat at the Hippopotamus restaurant at some point during my Paris stay. (No, I am not trendy, and yes, I've eaten at this chain before.) As it turns out, Hippopotamus overlooks Aquaboulevard itself, which gave me the chance to see the park firsthand. As you can see from the picture, there is no water in the pool. It turned out that at the time of my visit, the park was closed for renovation. I guess Parisians aren't clamoring to go swimming in early January. Two reasons why Route 128 may supplant Silicon Valley? In my various ruminations on Silicon Valley, I have rarely dealt with the issue of sexism, only touching upon it once in a discussion of Goldieblox (back when the whole Beastie Boys thing was going on). But Route 128 may have something to say about sexism. Massachusetts had a long history of technological innovation. The state could claim to be the birthplace of numerous industries, perhaps of the industrial revolution itself. In the early 1900s, many area scientists, inventors, businessmen, and investors were focusing on the new field of electrical sciences. Research labs at Harvard and M.I.T. pioneered technologies using electrical currents, magnetic fields, and advanced circuitry. After World War II, when Route 128 was constructed in the Boston area and influenced the traffic of the region, several newer technology companies emerged, including Raytheon, Digital Equipment Corporation, Lotus Development Corporation, and many others. (And don't forget that Bill Gates, Mark Zuckerberg, and others were in Massachusetts before heading to New Mexico, Washington, and California.) It wasn't until the 1980s that people began ignoring the multiple technological centers in the United States and just focused on the one south of San Francisco. Could the Boston area become the more hospitable alternative to the Silicon Valley goliath, an innovation hub that supports women, values diversity, and champions work-life balance? While the article bandies about words such as "superficial" - things that made me choke on my gluten-free organic alfalfa sprout sandwich - the article claims that Route 128 holds particular advantages. Tech leaders say two factors are already working in Boston’s favor: The limited geography of its startup community makes close-knit networks inevitable, and experienced women have proved willing to extend a hand to younger peers. As the region works to differentiate itself from the Valley, more investors are noticing. According to the National Venture Capital Association, Massachusetts was the top VC fund-raising state in 2013 at $5.5 billion; California, usually the leader, came in at $5.3 billion. When you consider the difference in population between the two states, that's significant. Of course, if we all believe that we're moving toward virtual communities anyway, none of this should matter. Eating your own dog food, or dogfooding, seems like a no-brainer, provided that your company offers the product that you need. If you need to perform word processing at Microsoft, why not use Microsoft Word? If you're an Apple employee who needs a phone, why not use an iPhone? But we often forget that dogfooding can be very risky. EFFECTIVE IMMEDIATELY!! NO MORE TYPEWRITERS ARE TO BE PURCHASED, LEASED, etc., etc. Apple is an innovative company. We must believe and lead in all areas. If word processing is so neat, then let's all use it! Goal: by 1-1-81, NO typewriters at Apple... We believe the typewriter is obsolete. Let's prove it inside before we try and convince our customers. At first glance, it sounds simple. But remember that this was 1980, not 1984. The typewriter-less employees weren't using Macs, or even Lisas, to compose their letters. And they certainly weren't using LaserWriters. So what was Mike Scott's Apple using for its dogfooding? Instead of typewriters, the several hundred employees involved in composing or disseminating letters, memos, documents, or reports use a typewritersized Apple II with built-in keyboard, a pair of add-on disk drives, a video monitor, and Apple Writer, the company's own disk-stored word processing software. This is clearly no IBM Selectric. Yet Apple Computer was able to run its company with those Apple IIs...and a few leftover typewriters...and a DEC minicomputer. And despite the lukewarm response to the latest Apple model - the Apple III - Apple's Ann Bowers promised new things on the horizon. "If you think what we're doing is going to change the workplace, stick around -- this is only the first wave. There are some things that I'd like to see. The next time that a person exercises his or her freedom of religion by wearing a colander, I would like to see that Pastafarian wear that colander all the time. And the next time that a person - or another person - or another person - sings the praises of the "Effortless Meals" from Walmart and Coca-Cola, I would like to see the person(s) commit to having Coca-Cola for dinner every single night. Coca-Cola again? Mom, couldn't we have prune juice or something? The term is believed to have originated with Microsoft in the 1980s. While it was originally used in reference to software companies using their own internally-generated tools for software development, its usage has spread to other areas as well. Bill Gates believed in eating your own dog food as late as 2011, when discussing gadgets for his children. But with all deference to Mr. Gates, the best example of someone eating his own dog food was Jeff Ginn of Lucky Dog Cuisine. Bluffton resident Janice Elenbaas started Lucky Dog Cuisine using her own recipes of all-natural ingredients. She makes meals that could be found on a plate or a dog dish -- grass-fed beef with brown rice and a tomato and vegetable. As a fundraiser for Canine Cancer Awareness and For Paws Hospice, her husband, Jeff Ginn, will eat Lucky Dog for dinner in various concoctions every night through October. They'll record their culinary adventures and share them on their website, where visitors also can contribute to the charities. The video documentation of the 30 day challenge can be found here. But Ginn wasn't risking his health of anything. He wasn't drinking Coca-Cola. When you are spending beyond your means and have to get a loan, the loan officer may impose some restrictions on your spending. While the intent of these restrictions is to encourage better financial behavior, these restrictions may have negative side effects. Over the last twenty five years, three West African governments - those of Sierra Leone, Guinea, and Liberia - have been receiving financial assistance from the International Monetary Fund (IMF). As several authors note in a paper that was recently published in Lancet, this assistance had three major strings attached. First, economic reform programmes by the IMF have required reductions in government spending, prioritisation of debt service, and bolstering of foreign exchange reserves. Such policies have often been extremely strict, absorbing funds that could be directed to meeting pressing health challenges. Lancet, for those who have not heard of it, is a medical publication, and thus is sensitive to "pressing health challenges." A loan officer commonly tells the borrower to get his or her affairs on a sound financial footing before spending money on other things. The loan officer - in this case, the IMF - is worried that the borrower (in this case, the three governments) will spend money foolishly. Regardless, the governments ended up concentrating on debt service, to the exclusion of other issues. This was complicated by the second restriction. Second, to keep government spending low, the IMF often requires caps on the public-sector wage bill—and thus funds to hire or adequately remunerate doctors, nurses, and other health-care professionals. There is often a feeling that "government bureaucrats make too much money" and that "a Congressman or Senator should make the minimum wage, so that he/she knows what it's like to do so." And if there are restrictions on salaries for elected officials, then there are often corresponding restrictions on salaries for non-elected officials. After all, you don't want a football coach at the state university to be making ten times as much as the state governor. Personally, I'm not bent out of shape when Congresspeople make $200,000 a year, a President makes twice that, and a football coach makes twenty times that. The market has determined that these people are worth that much, if not more, in salary. It may not be "fair," but it's necessary to attract people who could otherwise command huge salaries in the private sector. If you spend less, you'll get lower quality. Even the staunchest Tea Partier would shudder at the idea of a President who is only worth the minimum wage, and even the person who hates football would be distressed if State U hired a 16 year old to manage the football team. And then there are doctors - the particular concern of the people writing in Lancet. It's kind of hard to argue that you should go cheap on doctors, but that is the consequence of the types of financial restrictions that the IMF was imposing. "Maybe we can get some med students." Perhaps. "Hey, Pete here can bring up anything in WebMD." Great. Then there's the third IMF restriction. Third, the IMF has long advocated decentralisation of health-care systems. The idea is to make care more responsive to local needs. Yet, in practice, this approach can make it difficult to mobilise coordinated, central responses to disease outbreaks. It often happens that the people with the money dictate the specific solution to be followed. The IMF dictates that health care must be decentralized. The Gates Foundation dictates certain things about condoms. The Commies in San Francisco dictate that all city services must be provided by transgendered short people at twice the living wage. The baby seal clubbers in Podunkville dictate that the schools must teach that Moses was the first President of the United States - and that he wasn't Jewish. It's tough enough when these decisions are made by experts in their fields - there are certainly pros and cons to decentralized healthcare, for example. But when non-experts who have stayed in Holiday Inns are making the decisions, things can get worrisome. Why all of this emphasis on what the IMF did with these three countries? Because of a severe case of Monday morning quarterbacking. Yet, could it be that the IMF had contributed to the circumstances that enabled the crisis to arise in the first place? A major reason why the outbreak spread so rapidly was the weakness of health systems in the region. While the researchers do not claim that IMF policies were solely to blame for the countries' slow response to the Ebola outbreak, these past conditions apparently didn't help the countries prepare for this. See the abstract from Alexander Kentikelenis, Lawrence King, Martin McKee, and David Stuckler, the accompanying press release from the University of Cambridge, and this item from Homeland Security News Wire. Unintended consequences of throwing all the illegals out. Over the weekend, I wrote an answer to a Quora question. What will be the economic impact (long term / short term) if US government hypothetically deports all of the 12 million undocumented immigrants by the end of 2013? Some anti-immigration group suggest that these jobs will be filled by 23 million US nationals, Is it really that simple? Common sense says that this will be a massive shock to the economy and it will likely go to a recession. But, will the economy be better off in the long run ? Do the illegal immigrants decrease the aggregate welfare of US as the anti-immigration groups claim? Obviously the question has been around for a while, but it didn't start receiving traffic until recently. The long term effects are the most interesting ones. Due to the contraction of the labor market, wages for these jobs would go up...resulting in price increases... resulting in a short term lower demand. But that is the short term. In the long term, the jobs themselves would migrate out of the country, so that activities such as farming would move out of the US and to Mexico and China. Those jobs that could not move, such as restaurant and car wash workers, would be replaced with automated processes. Of course, the politicians would respond to pressure by repealing NAFTA and outlawing robots. Meanwhile, Mexico and China would have problems of their own, as wages in those countries would rise dramatically. As wages rise to the equivalent of $5 an hour, even for unskilled work, product demand (already hit by restrictions on exporting to the US) would tumble as prices rose. However, they would still be better off, because at least there would be work. Eventually, Americans would illegally go to Mexico and work, seeking better lives for their families. Long-time readers know that my response reflects some of my previously expressed concerns. For example, I've written about the low minimum wages in other countries in 2008 ("Minimum wages in other countries - we never had it so good") and earlier ("The Solution to Illegal Immigration, But It Will Take Communist Action Over Baby Seal Clubbers"). I've also written about automation ("You will still take a cab to the doctor’s office. For a while."). P.S. I haven't looked at minimum wages in Mexico in several years, but those minimum wages continue to increase. New minimum wages were approved for 2015. The minimum wage in Mexico is based on two geographic areas. As of January 1, the daily minimum wage rate for Zone “A” will be MXP (Mexican Peso) $70.10, and for Zone “B” it will be MXP $66.45. If you assume an exchange rate of 15 MXP to 1 US dollar, we're still talking about daily minimum wages that are lower than hourly minimum wages in the United States. Be sure to read the article to see why minimum wages haven't risen even more dramatically. Normally in tech markets, the competitors in the market are always trying to score competitive advantages against each other. For example, even though the operating system market is an oligopoly, you constantly have the operating system vendors coming out with new releases with new features to outdo the competition. But when you go down the chain, sometimes the competition gets a little less competitive. For an example, look at the Android 5.0 Lollipop release. Google obviously really wants Android users to adopt it. And Google has gotten Samsung on board, and Samsung is reportedly heavily championing the new release, ensuring that its existing devices will support it. So when will U.S. users see Google's new release on their Samsung phones? Well, there's one more player that has a say in that. The rep noted that while he did not have any specific carrier timelines for an update, he was told that Samsung has been weighing heavily on the carriers to move updates out faster. Think about it. This provides a possibility for Verizon or AT&T or one of the other carriers to score an advantage over the competition. "Sign up with us," they could say, "and your phone will have the latest updates!" Yet from the perspective of the carriers, deploying an operating system update to their customers is a hassle, not an opportunity. They have to invest in additional customer support staff. They have to rework their carrier-specific ringtone purchase apps. Someone in advertising needs to redo the specs. It appears that the carriers, despite being surrounded by technology, aren't really tech companies. They're utilities - an Edison, a General Motors 1.0 - that happen to deal with tech products. Take Verizon Wireless. Yes, its "about the company" page talks a lot about technology and innovation and all that, but what are the first words that appear on the page? Yeah, Verizon keeps the network up. And Amazon keeps the servers running. And Apple puts the special glass and the plastic together. There's a difference between connecting people and keeping people connected. Connecting people implies innovation, and a willingness to push boundaries. Keeping people connected does not. Which is why mobile phones (except for Apple, which has more leverage) are basically bricks that are mostly unchanged and useless after 18 months.